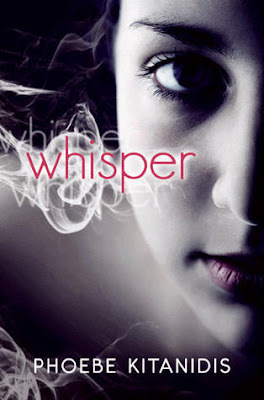 Whisper (Whisper, book 1) by Phoebe Kitanidis. Joy and the female members of her family hear Whispers, the thoughts and wishes of those around them. Joy and her mom feel the need to grant these wishes whenever possible but Joy's older sister Icka watches on with disdain. Icka hints that there are more to Whispers than their mother mother is telling them and that Joy's power is about to change--for the worse. Are Whispers a blessing or a curse? What happens next may just change everything, but then again Icka could just be up to her old pranks and sabotaging ways. I have to admit that though the concept of Whispers was intriguing I found the characters in the first few chapters shallow and unlikeable. I came close to giving up on this book and I am glad that I didn't. Whisper is a great start to a new young adult paranormal romance series. I recommend Whisper to readers of young adult, fantasy, paranormal fiction, urban fantasy and especially to fans of paranormal romance. I thought the concept was very interesting and as the story unfolded got better too. Good review. I've read alot of good reviews about this book. Great review and cool new makover. I can't wait to see it finished.